At the risk of being accused of hyperbole (which is a serious charge), I’d suggest that Streaming by Jon Welch, performed by Pipeline Theatre at the Pleasance Theatre in Islington contains three of the most powerful performances available to theatre goers in London at the moment. I can’t guarantee that there aren’t equally good performances elsewhere, because I’ve seen very few plays recently, but the energy, conviction and sheer stage presence of Angus Brown, Kyla Goodey and Anna Munden is exhausting in just the way it ought to be. Of course a good script to work to is important, and they have that in Welch’s downbeat riff on the Wizard of Oz. A father, Toby, and daughter, Rosa, previously well-to-do, have fallen on hard times following the death of wife/mother and the loss of Toby’s job, and have had to move into low-rent accommodation. Their neighbour, Candy, provides online sexual favours for paying clients. She befriends the lonely, teenage Rosa, who finds disagreeable her father’s desperate attempts on the one hand to get work and on the other to keep her happy. 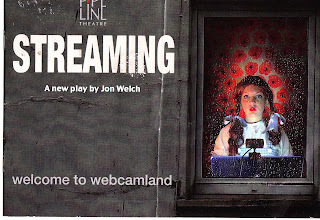 Toby declines into alcoholism; Rosa moves in with Candy, becomes ‘Dorothy’, and starts her career as a webcam girl. Perhaps I could be accused of spoilers but actually what grips right from the start is the intensity of the performances. The play itself has holes (why doesn’t Rosa go to school?) and rather rushes to its end. According to the author’s notes in the programme, the play is an investigation into the cost of the objectification of women, but actually – and this saves it from being a simple-minded piece of agitprop - one’s sympathies are not wholly with Rosa. Toby’s situation – widower, financially ruined, alcoholic, and with a teenage daughter intent on making her own way – is hardly to be envied. Either we must accept that his advice to his daughter not to make friends with Candy is sensible or we must decide that Rosa at sixteen is old enough to make her own decisions. In the final masque there is a sense that Rosa and Candy have somehow triumphed over Toby, who has been reduced to a wordless masturbator. It is hard to feel that any of the characters deserve their fate. Angus Brown and Anna Munden make an astonishing pair on stage, the one manic in his despair, for ever rubbing his scalp (hair all pulled out perhaps) pinching the bridge of his nose, and stalking the small room, his phone limpit-like to his ear; the other, in contrast - Anna Munden as Rosa - is quiet, with a mesmerising stillness. This stillness directs one to her face. She acts with her eyes, and the movements are never affected; always subtle, always natural, but also always emphatic. Having seen her in Pipeline’s previous, brilliant, production, Transports, it is evident that she has the makings already of an exceptional actress. She has inimitability. No-one is like her and she is like no-one. There is comedy and comedic pathos in Kyla Goodey’s performance as Candy. I had been concerned to begin with that she was playing too close to the Catherine Tate character Lauren Cooper or Vicky Pollard, but she stayed just the right side of stereotype. As with Transports, the stagecraft is exemplary. So often in Fringe theatre the audience is made uncomfortable by the awkwardnesses of the staging. Pipeline do holisitic work, all is of a piece. It is difficult to imagine the play being done in any other way. The design is simple but clever, the lighting and sound design more or less flawless, the costumes properly thought about and executed. This is first rate theatre. Go and see it.